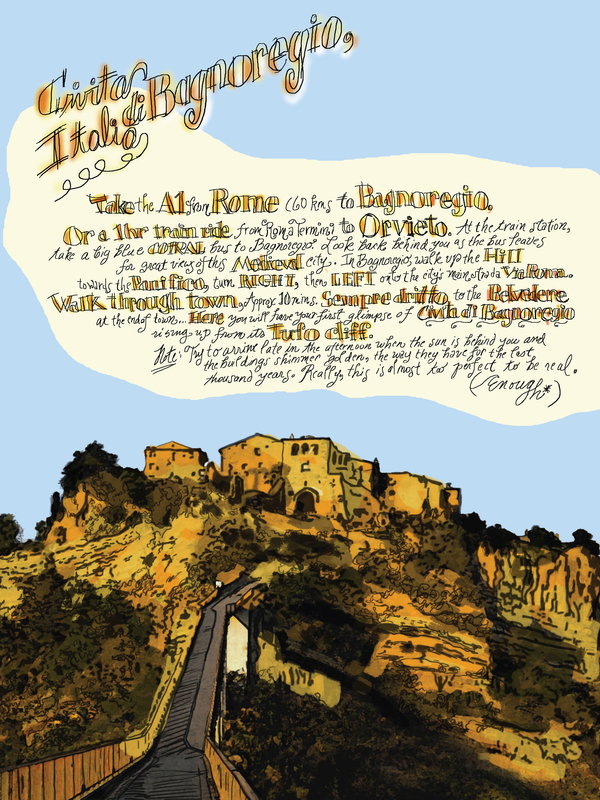 In 2012, I received the Astra Zarina Fellowship from NIAUSI, The Northwest Institute of Architecture and Urban Design in Italy which allowed me to spend two months living and working in Civita di Bagnoregio, a World Heritage hill-town in Lazio, Italy whose roots date back nearly 3,000 years to the Etruscans. On Friday, March 14th, I’ll be presenting my project, Civita immaginata: Mapping a Historic Landscape at NIAUSI’s Fellows Festival along with Liza Mickle, Don Fels, Isabel Sitcov and Alan Maskin at an afternoon seminar at SRG Partnership in Seattle, followed by an evening reception and auction at NBBJ Seattle. As a designer, first and foremost, I organize information and try to make sense of sometimes very dissimilar things. But I’m also a storyteller, and this dual persona was a primary component of what I wanted to bring to Civita when I set out to create a series of maps that would attempt to make my own personal sense of a very special place. And this is probably as good a time as any to put out a disclaimer that I am not an architect or an historian so there are likely errors in some of these maps for which I take full responsibility. So, why maps? Why not a series of posters or brochures? For designers as well as the general public, maps provide one of the primary ways of making sense of a place. But maps can also help us grasp deeper concepts, detect patterns, prognosticate. Civita immaginata invites viewers to go beyond what is depicted on the surface, to examine the many layers of meaning, culture and history that exist in one place. Traditional maps are essentially arbitrary selections of information yet as users, we assign great ambitions to them. Implicitly, we trust them to help us navigate and make sense of the world. Quite often they succeed but sometimes in a controlled, coded language, and for many people who don’t how to analyze the data, they’re often complex and hard to understand. I wanted to see if a broader view of mapping, one that included an emotional component, might increase their accessibility for viewers, not just to their content but to their understanding of place. In traditional societies, there was no need for maps. Words and memories built history, and what was “known” was transmitted from memory to memory. Yet this need we have to define the areas we explore and inhabit, to mark our territory, to organize it and often, change it seems fundamental. Map designers always need to make choices: what to leave in and take out. Everything goes through a kind of cartographic surgery, through layering of texture, color, image, text, symbol. Fortunately, we’re generally so familiar with the language of maps that we trust them, and mapmakers can take some liberties. But to map is to lie, since there is always a bias, always a point of view both literally and figuratively. Oscar Wilde said, “Every portrait that is painted with feeling is a portrait of the artist, not his sitter.” Maps are like portraits—mysterious, sometimes abstract and sometimes deliberate exaggerations. Not only is this to be expected but in my opinion, it adds to the character of maps, creating an open-ended invitation for viewers to enter. I’ll be sharing my project results in a series of posts over the next week, as well as some thinking on my map-making process and would love to hear your thoughts.